The water front property was delightful. We enjoyed watching the wildlife as all times of the day. The surrounding towns were filled with quaint shops, delicious eateries, and friendly people. The house was very clean and comfortable. We came home feeling relaxed with many fond memories of friendship and fun. We just love this property! It represents the best of Eastern Shore living and is so conveniently situated. We enjoyed the tranquil beauty of the water and the gorgeous spring sunsets, but fun towns like St. Michael's and Easton were a quick drive (even bike ride) away. The decor of Thistle Dew welcomed and delighted us, and we found every amenity at hand. The property is so splendid and the trees were in full bloom. Wow! Lovely fireplace in the great room and there are wide water views from nearly every room in the house. The floor plan is perfect for families and couples; the spacious master bedroom is separated from the other bedrooms. So romantic, even with your children in tow! Can't wait to go back. Problems with access to the property and previously reported maintenance issues. Beautiful house with great facilities. A short drive to many great bars and restaurants. For those looking to rent for Eagleman, A great location about 35 min drive, away from the crowds. Very relaxing. We spent a great weekend at Thistle Dew in September. It's in a convenient location - a quick drive to both Easton and St Michael's. It is a quiet spot with beautiful views. Great area for kayaking. The house was just as described. The outdoor spaces were not as well maintained - perhaps because it was off season? The screened porch needed to be swept and wiped down and the pool needed to be skimmed and the filter on the automatic pool cleaner emptied. We did not call the management company as it was easy to take care of ourselves. Once we did both the porch and the pool were great outdoor spots. This is the 3rd time we have rented in Sept from Eastern Shores and all 3 houses have been just as great as advertised. Four couples shared the house for a reunion of sorts. We had a great weekend lounging by the water and enjoying the screened in porch. Would recommend to anyone looking for a relaxing getaway, close enough to Easton for access to commerce, and close enough to St. Michael's for access to all that it offers. Possibly the best vacation I have ever had! The house was perfect for us and we truly appreciated being able to bring our two little dogs. The view was wonderful. Having a pool to relax at with our kids was an absolute must and delight. The only "complaint" would be that the screened in porch had a few large spiders residing there (definitely long-time webs) and many of the dishes were not clean despite being put away. Just a few minor details that stopped me from giving 5 stars to appearance. Otherwise, 'this will do." The 7 of us enjoyed all Thistle Dew offers. Our 7 and 4 year old grand kids lived in the pool. We BBQ'd, cooked, played pool, played games, kayaked, and more. And, we did a lot of sightseeing in the greater area. Bottom line,this was a great week at a property right for us. This property is a lovely cottage nestled in the woods surrounded by the beauty of nature. You'll wake up to the birds chirping and lovely vistas of the river genty rolling along. The decor of this home is well appointed and the location between Easton and St. Michaels is great. We relaxed, played pool, and just enjoyed the serenity of the place! The house is darling... it has everything you'd need and I really appreciated finding all the staples (sugar, flour, s&p, soaps, TP) at the house. It was very clean. There was a bit of a stink in the house which I imagine was from being closed for a period of time. Fortunately, the weather was good and we were able to open the windows and air the place out. The biggest matter was the ongoing work on the pier... carpenters on day 1, a pile of scrap wood and junk and a near-empty trailer parked in the back yard. Fortunately, after a complaint to the rental agency, the pile was picked up. But the trailer remained the entire stay. The house was fine but for two things. No closet available in master BD .There is no railing on steps from deck to yard leaving no access to yard and dock for mobility challenged such as myself. Chairs not very comfortable. Fish not biting and no crabs. The location was great! The dock area worked well for our needs. We used the pool quite a bit and if their was a place to improve upon, it was the pool area. The brick area around the pool was cracking and the furniture was not nice. We knew this going in so we brought our own chairs. The public ramp was convienent to the property. It was a 15 min boat ride into St. Michaels. It was a great place for us, being 4 couples. The house seemed larger than the listing depicts. We had a great time. The house is well decorated and full of treasures. The views are spectacular including the sunrise in the morning and the sunset at night. The house is ten minutes from St Michaels and ten minutes from Easton. A perfect location. We'll be back! A very relaxing and pleasant stay at the Orchard.The hot tub was nice to slip into after a day on the water.Looking forward to booking next year with Eastern Shore Rentals. The Orchard is a nice property in a great location. The home has modern amenities, and is well maintained and clean. There were a couple of things though that would probably have me looking elsewhere next year. First, there's no ladder on the dock. We brought a couple of kayaks and it was very difficult for a couple of my children to load/unload, particularly at low tide. Second, there's no dining area outside. We like a screened porch or even a table on a deck where we can eat outside but there's nowhere to do that. Lastly, a few more reclining pool chairs would be nice. There are two and few other sitting chairs. Between my wife and three girls, there was a lot of competition for the two recliners.So overall, a fine house but not as suitable for our family's activities as we would've liked, particularly at that price point. Our fourth visit in 3 years was yet another one filled with great Eastern Shore memories. 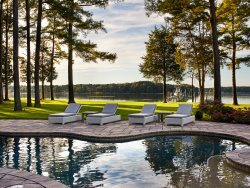 The phenomenal location right on the Miles River; private dock; large, modern kitchen for supporting dinner parties; and relaxing hot tub and refreshing pool combine to offer a very positive vacation experience. This was our third Memorial Day weekend at The Orchard, and yet again it was perfect for our group of couples (and two children). The property was beautiful and the location was great, not far from St Michaels and close to the shops in Easton.The one thing I was disappointed in was the fact that no one came each day to take care of the pool and the hot tub. The pool was fine but the hot tub got nasty after a couple days. Stay was great. Only drawback are the bathrooms, esp the one in the loft. The shower was not fixed. We were not told that it was not working prior to our stay. The house was very large with great amenities but some things needed attention. The outlets in the Master bath did not work, no water pressure in any of the showers. The guest shower downstairs did not drain properly, and shower upstairs was not usable due to leaks. The pool, the hot tub, and the kitchen were the best features of the house along with being on the Miles River. We did not report any of these issues as we did not want to have anyone visit the house during vacation. Our family enjoyed a fantastic vacation at The Orchard! Loved the views, the pool, everything about the house, the nice layout, the dock, and even the giant TV, perfect to watch an exciting week of Olympics coverage! Truly one of our best vacations! The Orchard was one of the nicest vacation homes we have ever rented. Great location between St. Michael's and Easton, both of which have great shops and restaurants. Our family thoroughly enjoyed the pool and hot tub! All in all a great vacation! We had a very relaxing time. We caught alot of crabs, swam, cooked and just hung out. When we needed assistance the management co. came right away. Thank you guys so much. Lovely eclectic home, very clean and comfortable. Absolutely loved the pool, jacuzzi, and fishing from the dock.